(If you don’t know about TED, click here to learn more). While JR does not offer the reason for his faces, I can make some educated guesses. He chooses to photograph the underprivileged, the forgotten, the groups of people and individuals most cities and people try to forget. He highlights this and forces people to recognize one another as individuals. He placed his portraits’ names and addresses on their images when he completed Portrait of a Generation. These photos were of gang members and people living in poverty stricken parts of Paris. JR pasted them all over the city. Talk about forcing people to take a serious look at the city in which they live! Do you know what else I admire about this man? He does NOT celebrate the cult of artist (think Picasso, Pollack, etc.). He actively chooses to be anonymous so that his work is the focus for his viewers. 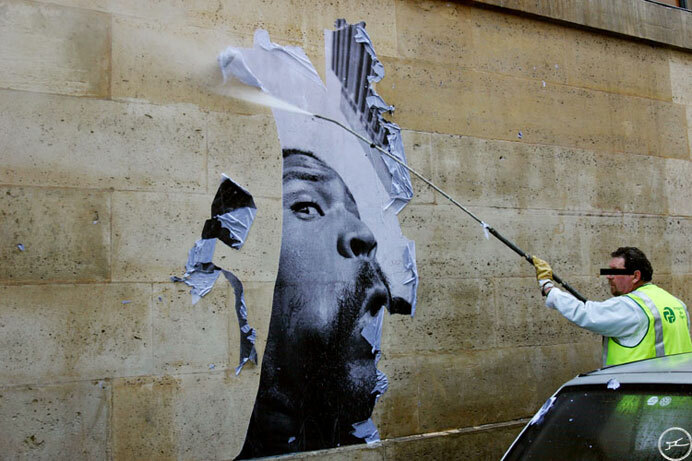 And by placing his work in a non-gallery or a non-museum setting, JR reaches audiences who might never stop to appreciate art and the power behind something as simple as a silly face. A particularly poignant project of his is Women Are Heroes. He has traveled through parts of Africa and photographed women in the region. JR felt women best reflect the condition of their country/city/town. 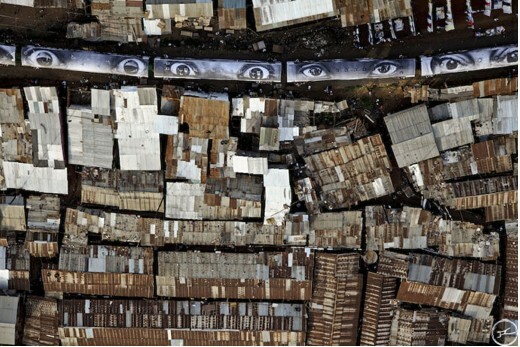 Some of these photos were printed on vinyl, which became waterproof roofing for slum shacks. I could profess my love for JR’s work more, but I think you get the picture (ha, ha). Here are additional sites you might find interesting if this post has intrigued you. Artist Strong Action: If there was ever a post to share with others, this is the one. Please spread the word about this amazing Creative and spread the wealth of knowledge that we all have the power to make a difference.